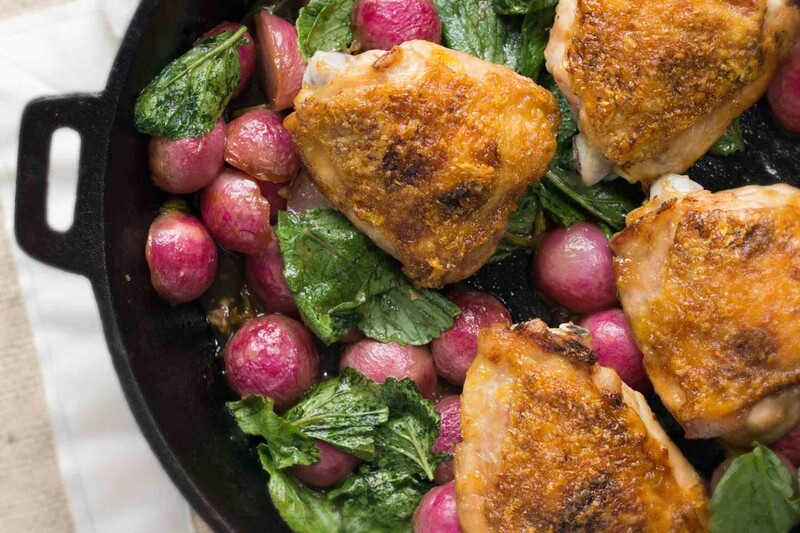 In a continued effort to simplify my life, spend less money, and wash fewer dishes, I came up with this recipe for roasted chicken thighs and radishes. And, of course, I’m always on a mission to eat well. I’m happy to say, this chicken covers all of my needs. This dinner is a 1-skillet situation. 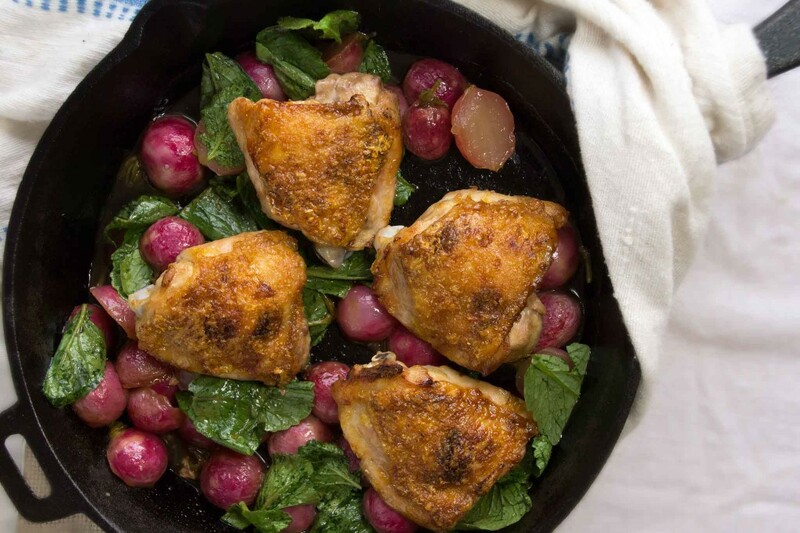 Honey-lacquered chicken thighs are roasted over a bunch of halved radishes. Once roasted, the radishes are tossed with the green radish tops and finished it with a squirt of lemon. 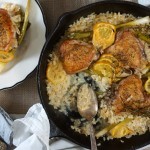 Eaten on a damp, chilly night, this had a lightened up comfort food quality that was just right for a rainy spring dinner. 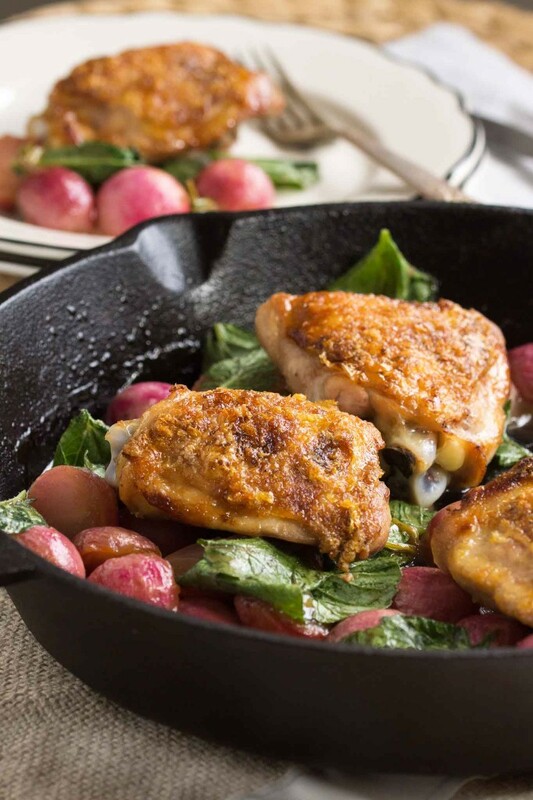 The grocery list for this one is short–just a few chicken thighs, a couple of bunches of radishes, a lemon, and I’ll bet you’ve already got the honey. Cut the radishes in half and save the tops–they’ll be our greens for the dish. Pat the chicken dry, season it liberally, and sear it on the stovetop. After the skin has been crisped up, pull the chicken out of the pan and put the radishes in. 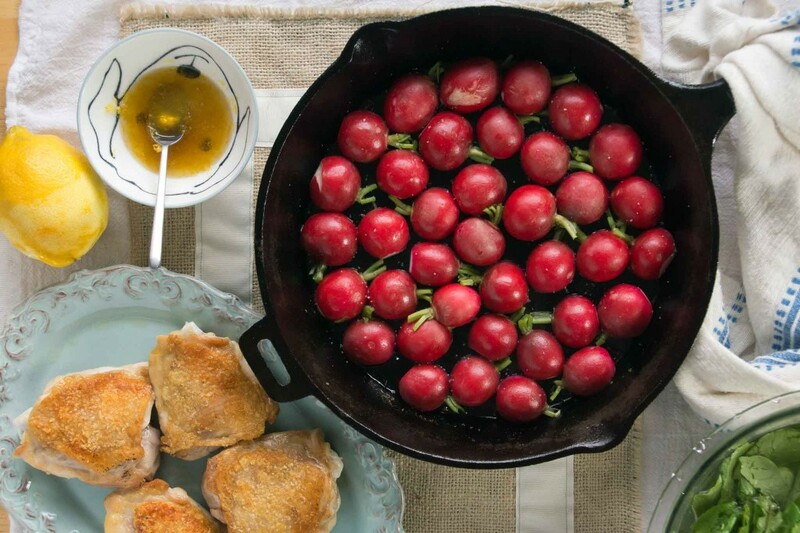 Set the chicken thighs on top of the radishes and paint the skin with a mixture of honey and lemon zest. 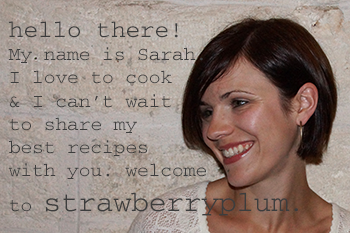 Pop the pan into the oven to roast until the chicken is cooked through and the radishes start to shrivel and mellow. Now toss those radish greens with the roasted radishes, a squirt of lemon juice, and some coarse pepper. 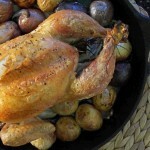 And that’s it–simple but satisfying roasted chicken. It’s easy on effort and budget, heavy on rainy day comfort food factor. I couldn’t ask for anything more. If your radishes came without the greens attached, feel free to substitute spinach, arugula, a bunch of fresh herbs, or a handful of peas. Preheat oven to 400°. Pat the chicken dry with paper towels and liberally season with kosher salt. Heat an oven-proof skillet with a thin coating of olive oil over high heat. Add the chicken thighs, skin-side down, and sear until the skin is golden, 6-8 minutes. Flip and briefly brown the opposite side, about 2 minutes. Remove the chicken from the pan and drain off all but a very thin coating of fat. 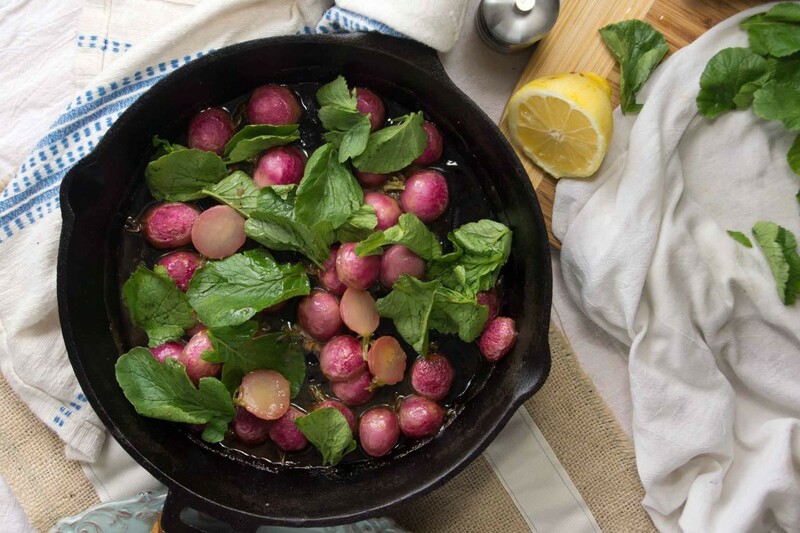 Place the radishes, cut-side down, in the hot skillet. Sprinkle with salt. 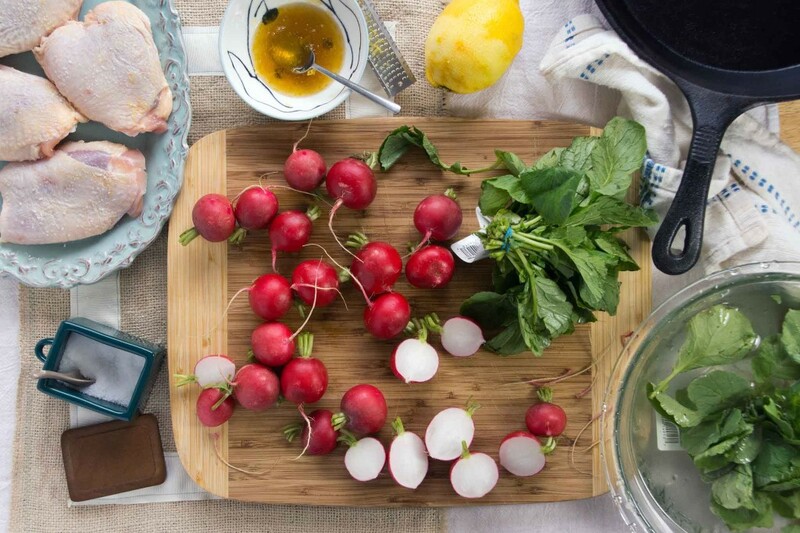 Set the chicken, skin-side up, on top of the radishes. In a small bowl, mix together the honey and lemon zest. Brush about half of the mixture onto the chicken skin. Transfer the skillet to the oven and roast until the chicken is cooked through and the juices run clear, about 30 minutes. 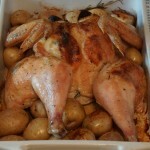 Halfway through roasting, brush the remaining honey mixture on the chicken skin. When the chicken thighs have finished cooking, transfer them to a plate. Add the radish greens to the skillet and toss them with the roasted radishes, allowing them to wilt down slightly. Season with a touch of fresh lemon juice, black pepper, and salt, as needed. Divide the vegetables between warm plates and top with a chicken thigh (or 2).